Today’s overseas openings for Working Title/Universal’s Oscar-nominated Les Misérables pushes it past $200 million worldwide. Domestic grosses are currently at $109M and international grosses at $96.7M before it opens in four other territories this weekend: New Zealand, Netherlands, Cyprus and Vietnam. With tonight’s releases, Tom Hooper’s adaptedd musical is currently open in 22 international territories with 40 still to come over the next two months. Les Misérables had a record-shattering opening in the UK today, grossing an estimated $3.7M (£2.3M) for Friday alone. It is the #1 film in the marketplace by a huge margin with 46% market share. 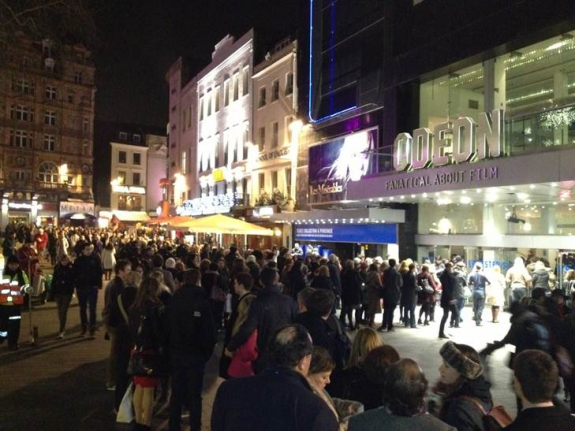 Here’s a photo of lines outside London’s largest theatre, The Odeon in Leicester Square: its 3,000 seats were totally sold out. The film opened in 589 locations, which is Universal’s widest release ever in this market. Execs tell me the opening day gross is the biggest opening day ever for a musical, the biggest opening day for Working Title, and the biggest opening day ever for Tom Hooper in this market. It is Universal’s 2nd highest Friday opening ever behind Fast & Furious. UK pre-sales were some of the all-time largest. Worldwide, Les Misérables is the highest grossing musical of all time in Korea and Hong Kong, and Universal’s highest grossing film of all time in Korea.Plus, it’s the biggest opening of a musical in Australia, Spain, Singapore, Hong Kong, Korea, and Trinidad. Domestically, Les Misérables grossed $18.2M on its Tuesday Christmas Day opening in North America, the second-highest Christmas Day opening in box office history for the highest non-weekend Xmas opening ever. The film grossed $103M domestically in just 13 days, making it the fastest climb to $100 million for a musical in history. The weekend opening of $27.3 million was the highest North American opening weekend ever for Working Title.